High Shoals had always been a place that held a fascination for me. Reverend Elmer Anthony was from High Shoals. He baptized me and preached funerals at Union Church for my grandparents, Cliff and Hassie Daniell Dawson. He was also a School Superintendent and Principal. Several classmates, friends and clients have been from High Shoals. The late Jack Landers was Mayor when I moved back to Watkinsville in 1970 to practice law. I was hired as City Attorney that year and served for over 20 years. The Council Members were Dr. Joseph Bennett, G. W. Eades, Reverend Joe Dickens, Frank Parks and Herschel Lovern. The clerk was Caroline Anthony Eades – a high school classmate. All of these people have been long-time friends. After the Shoals part of the river were purchased by the Founder of High Shoals Beach and Paridisio Falls, the River area was fenced and the general public could not enter without paying admission. The Mayor and Council held a meeting on the subject one summer night. There was an overflow crowd that spilled into the yard. Reverend Anthony was there and urged restraint and had prayer I believe. The new owner explained the new rules about the shoals. Some natives described how they had played in the river as children and did not feel it should be closed. At one point, it got so noisy and rambunctious that Mayor Jack Landers banged the gavel. In an expression of exasperation, he said, “.. I wish that Damn River would dry up!” Then he looked toward Reverend Anthony and said, “Sorry, Uncle El!”. I have told that story a number of times on Jack- most recently at his viewing with his many relatives and friends of High Shoals. 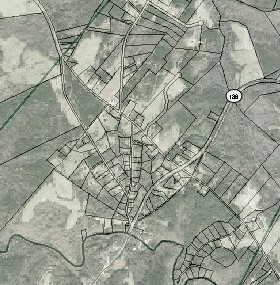 The building farthest to the right is the store/post office run by Mr. Tom Stowe and Mr. Hamp Lord. To its left is the present day Town Hall building which was the office of Dr. Sam Elder in the early 1900's and also served as a lodge hall. To it's left is the High Shoals Christian Church. The next building on the left is the old store owned by J. H. Lowe which no longer stands. Behind and to the left of this store is the old Osborn home which was once the residence of Sylvester Osborn. High Shoals today is an even mixture of the descendants of the original mill workers and newer residents. It still maintains its small-town nature despite the increased pace of the modern world. As you can see in the picture above, the Town Hall and Christian Church still stand as well as the Osborn home on the left. This is a view down Jefferson Road from its intersection with Hopping Road, named after the mill's co-founder, E. S. Hopping. We did some legal research and established that the State owned about 100 or more feet of Right of Way for GA 186 across the river. The general public could fish from the bridge. Oconee Deputies were frequently called in the early 70’s to get folks out of the River. High Shoals has made many memories for numerous generations and will probably continue to do so. The River and Beach should be a public Park and available for posterity. Most of it is still under one ownership and does not have houses hanging on the river banks. A Resident of High Shoals Now Residing in a Foreign Country wrote of her memories…. The factory at High Shoals made cotton thread of various sizes and quality for making fabrics of various types. No fabrics were ever made at High Shoals, but the cotton threads were well known for their high quality. The factory began production about 1830, I believe, and was well known throughout the Eastern USA. You will find this information in an interesting little book put out by the CWF (i think)of High Shoals in the late '60's-70's. I have a copy which I treasure. The factory burned in the 1920's. This page is intended to provide historical resources relating to the town of High Shoals, Georgia, a former mill town on the Apalachee River at the junction of the counties of Oconee, Walton, and Morgan. The picture is of the High Shoals Manufacturing Company organized by Ephraine Stiles Hopping, Isaac Powell, Jacob Kluttz, Dr. J. A. Price and others in 1846 on the Morgan County side of the Apalachee River. It burned to the ground in 1928. Click the picture to see a larger version. Two of my grandfather's sisters worked there and that is why (my family) happens to have been on our side of the river. My father's people were from an area near the boundary of Barrow/Oconee County ------ and the Oconee County side of the river farming before that. My great grandmother and great grandfather are buried at Rays church and many other family members are too. My mother's family came from around Alcovy mountain area of Walton County and many of her relatives still live in that area. But back to High Shoals. When we were growing up the homecoming was held at the Baptist church and many of those attending were mill employees who left after it burned, I think in 1929. The houses extended up the hill on the Morgan County side behind the factory and up a little side street from the main road, and there were a few at the top of the hill in derelict condition when I was a child. There was a church there, on the top of the hill above the river in Morgan County and there were still tombstones in the cemetery there. I think it had been a Methodist church. When we were growing up, the churches in the community used to put on a joint Christmas service which was held at the Christian church because it had a basement for coffee and handing out gifts afterwards. Louise Nunn always organized these programs and a great many of the community performed in them, certainly most of the children did. The choir was made up of members of all churches, and I particularly remember Mrs Ammie Sue Anthony as a choir member for she sang with such gusto. She was a lovely lady. Mae Conley usually provided the music and also usually rendered a solo vocal performance. There were always wise men, shepherds, angels. Everybody in High Shoals attended and looked forward to the Christmas program. Afterwards everyone adjourned to the basement where there was a Christmas tree with a huge stack of gifts which everyone had brought with them to be handed out and a Santa Claus for the small children. 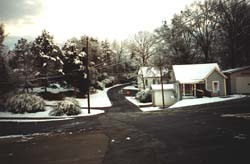 This is a recent picture of High Shoals at Christmas-time in 1996. This was one of the few times that it actually snowed in December. Notice the Town Hall in the foreground with the old fire station to its left and a newer fire station to its right. The Christian Church is in the background. The community spirit also was evident in the fact that every time there was a fifth Sunday in the month, the four churches (Baptist, Methodist, Christian, and Holiness), would come together for a joint Sunday school service at one of the churches. That was because the other four weeks there was a church service at one of the other churches. The Baptist had a minister every 1st and 3d Sunday, the Christian every 2d Sunday, and the Methodist every 4th Sunday. The Holiness had one every week I believe. Also the Baptist and Methodist always had joint services. When our Baptist pastor was there, we all went to the Baptist chuch for Sunday School and Church. When the Methodist pastor was there, we all went to the Methodist Church for Sunday School and Church. The fifth Sunday service was a moveable service, making the rounds from one church to another and every year each church hosted the others once during the year. I think everyone enjoyed those community services. And of course when there was a revival, the other churches turned up in support. When -- I married in the Baptist Church in the 60’s, the minister who married us was the minister of the Holiness church, Mr Joe Dickens. I had always had great affection for Mr Joe and Miss Opal, his wife, and wanted him to perform the ceremony. The present minister nor any church members thought anything about it. My husband, not being from High Shoals, was a bit surprised that the Baptist Church would let a Holiness church pastor perform the wedding in their church. A picture of the Christan Women's Fellowship. The picture was made in the sanctuary of the High Shoals Methodist Church. The members shown are: (l to r) bottom row: Mrs. Minnie Kennedy, Mrs. Opal Whitehead Dickens, Mrs. Sandy Miller Thomas, Miss Joy Biggs, Mrs. Caroline Anthony Eades. second row: Mrs. Claudia Mae Powers, Mrs. Mary Frances Lord Ginn, Mrs. Mary Ann Lord Amason, Mrs. Frances Woodruff, Mrs. Kathy Hill Shelnutt, Mrs. Pat Coker Jones, Mrs. Margaret Davis Jones, Mrs. Linda Brown, Mrs. Karen Stone Powers. third row: Mrs. Ruby Rhodes Stowe, Mrs. Floy Rhodes O'Kelly, Mrs. Mary Neal Ginn Thomas, Mrs. Beth Thomas Sosebee, Miss Louise Nunn, Mrs. Robin Thomas Stone, Mrs. Sandra Holmes Parks, Mrs. Martha Stone Biggs, and Miss Sara Lovern. The house we lived in was of course a mill house. A sturdy house which was not in best condition when Daddy bought it after the War, paying cash for it as we had not had anything to spend money on during the War, so he and Mother had saved enough to buy it outright. He spent a lot of time doing up the house. 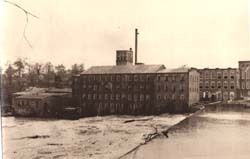 The mill and land surrounding the factory was not sold to the present owner by the company, at least not on the Walton and Morgan County sides of the river. It was sold to a "Pete" Norville around about 1940 who I believe lived in Watkinsville. He sold off the houses to people who wanted to purchase them, and the rest of the houses fell down through disrepair. When we first moved back there after the War, there were houses all along highway 186 in Morgan and Walton county, and I can remember the "Calaboose" which was still standing on the Morgan County side of the road when we were very young. It too fell down through disrepair. The kudzu vines also had taken over the land. Our land and my grandfather's and uncle's land across the road were likewise covered in the vine and it took quite some effort to eradicate it. This picture is a view across the bridge over the Apalachee River towards the Oconee County side. 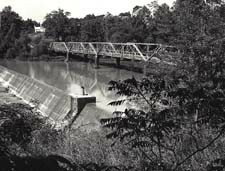 When Mr Norville owned the land, he did not prevent people from going down to the river, and we used to set out across the pasture to the river below the upper dam for a swim. Our parents felt it was safe, as most of the students went to the "beach" below the bridge in Oconee County, and we were not likely to encounter any naughty university boys up the river. Also (a family) lived at the top of the hill above the upper dam on the Walton County side and the (family’s) children used to go to the river with us to play. So their parents were not very far away. It was our own little swimming spot. Funny I have often met people who know where High Shoals is. Some years ago, a young sales rep called on me at a place ----- where I was a scientist. He had an American (actually Southern) accent and I asked him where he was from. He said Georgia. I told him I was from Georgia, too, and he asked me where. I said you won't know it, it is a small community, High Shoals. He did know it. He had been a student at the University of Georgia, and had spent some weekends on the "beach". He had lived in Bogart when he was attending University, so it was like meeting someone from home. When we were growing up we did not have much money. Nobody else did either so we did not feel deprived. Our parents always had a good big garden and two pigs. We were lucky to have grandparents across the road to look after us and my cousins who lived across the road to the right. We had in a sense three sets of parents to keep us on the straight and narrow, and who were interested in all of us, whether their own child or niece or nephew. it was a wonderful way to grow up. We used to ride our bicycles in summer, sometimes making a loop around by Snow's mill and back to High Shoals, all four of the grandchildren together. We felt safe and we were. We used to pick cotton every autumn to get money to go to the fair in Athens and other things we wanted. My uncle -------- used to save the fields near his house for us, and we cut through the woods to his place after school and on weekends to pick. While it was a good way to grow up, I think we also knew that we did not want to do that for a living when we were adults. Good stimulus to get an education and a better job, a philosophy which fortunately our parents also agreed with. Summers we spent together with our cousins across the road-- we were always together. Also a lot of the time a young boy was with us, a great friend of my brother. He was almost like another cousin in the fivesome we had. 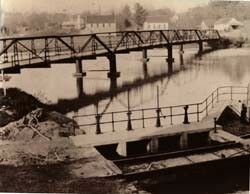 Picture of the old bridge over the Apalachee River in High Shoals. This picture was taken by Claude A. Anthony in 1956 as he stood on the Oconee side of the river near the "Landrum home." This home was also the same mansion once owned by the Hopping and Frazer families several years ago. We used to take two red wagons three times during the summer and go across the river to the Oconee side to fill up with books from the bookmobile. We spent hours reading in the summer. We read the books we selected and those the others selected. And the encyclopedia, which we had at home. I read that encyclopedia from start to finish one summer. About 20 volumes. But we did not spend all our time reading, the five of us used to cycle, we played a lot of softball together, and sometimes touch football.